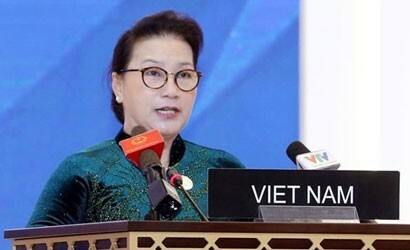 NA Chairwoman Ngan made the statement while addressing the plenary session of the 140th Assembly of the Inter-Parliamentary Union (IPU-140) in Doha, the capital city of Qatar, on April 7. NA Chairwoman Ngan said peace, security, and sustainable development are the goals that require all nations to make more joint efforts to build fundamental foundations, in which education is used as an approach and also a prerequisite condition. She said that Vietnam always gives priority to sustainable development, highlights education as its prime national policy to help raise intellectual standard, and generate high-quality human resources to meet requirements of Industry 4.0. The leader stressed the importance of increasing dialogue, international cooperation and partnership between countries, and regional and international organizations, providing maximum support for countries that meet limitations in carrying out comprehensive and inclusive education programs.